In its relatively short existence, The Courtside Collective has made significant inroads to the international basketball world. It has reported from such diverse locations as Belfast and Derry, not to mention Letterkenny. Additionally, we have covered events in the National Basketball Association, but, as yet, have said little-to-nothing about basketball across the fine continent of Europe. So it was, not without some trepidation, that I wandered into the Palau Sant Jordi in Barcelona on 18 February. My assignment? To report back to TCC’s axe-grinder in chief, Tony McGaharan. The event was Spain’s Copa del Rey (King’s Cup) basketball tournament, a three day affair which begins with eight teams and finishes with one victor. When it comes to a trip to Barcelona, there are two things that any self-respecting sports fan absolutely must check out in advance: the FC Barcelona fixtures and the FC Barcelona Regal fixtures. The former side is of course the actual football team and features Lionel Messi, arguably the best footballer of all time. Messi literally never takes a night off; if he’s fit to play, he plays and to the full extent of his abilities. He scored four as Barca whipped relatively-local rivals Valencia 5-1, but that’s another story. The latter team currently sits atop Spain’s ACB and was the two-time defending Copa del Rey champions. The Copa del Rey is basically Spain’s equivalent of the Ulster Cup (except it has “borrowed” the format of the Invitational Tournament, with all games played on successive days in a single venue) and assumes a high priority for all teams during the season; only the top eight sides are permitted entry. It is therefore fair to say that Northern Irish basketball has been highly influential in the establishment of the tournament, even though there is a fairly decent chance that nobody in Spain is either aware that (a) a place called Northern Ireland exists or (b) they play basketball there. They have much to learn. 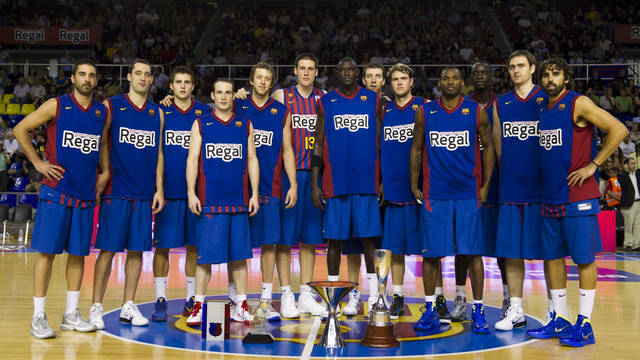 In recent seasons, FC Barcelona Regal (formerly Winterthur – their major sponsor) have been major players in the ACB, featuring in each of the last five ACB finals, winning two. A game at the Palau Blaugrana (located next to the Barcelona gift shop at the Nou Camp) is a fine occasion for any basketball fan: it’s relatively small and it’s very loud. Oh, and the quality of basketball is pretty good as well. A young fellow by the name of Ricard Rubio i Vives toiled to make a significant impact during his two seasons at the club, before moving to the Minnesota Timberwolves and capturing the imagination of American basketball fans. Prior to departure, I had investigated the basketball fixtures but found an inexplicable gap for that particular weekend, although it was clear that they were involved in something at the Palau Sant Jordi. At the time, I didn’t realise that that was also in Barcelona. So, we arrived and only when watching a Spanish news programme (more for background noise than anything else) realised that the eight best ACB teams were all in Barcelona that weekend and were playing games on Friday, Saturday and Sunday. After an unsuccessful attempt to purchase tickets online (there’s not much as nerve wracking as trying to buy something online in a foreign language, especially when an error message comes up after you’ve input your card details and the seats you tried to book appear to have been reserved), we decided that we’d spent our Saturday as we had planned – at Gaudi’s Park Guell in the north of the city – before going to the Olympic site to see if we could get to the games. 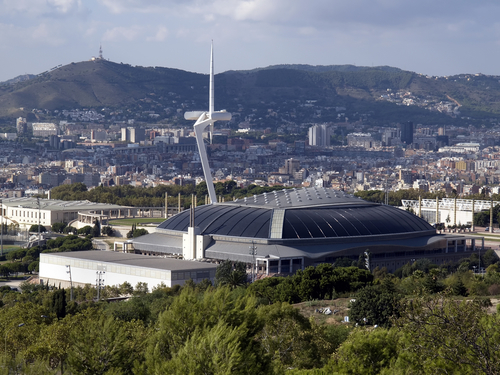 Handily, there was a local bus to take us up Montjuic to the formidable Olympic stadium, site of the 1992 games, and the Palau Sant Jordi, the scene of the great triumphs of the original Team USA Dream team some twenty (crikey!) years previously. My Spanish is patchy, to put it mildly – I was amused when I asked about tickets to be pointed in the rough direction of the ticket offices with the phrase “arriba!” – but I managed to secure us two tickets for the not-exactly-cheap price of €60 a piece. We walked into the arena where the finest players that the best basketball league in the world has to offer would fight for the honour of becoming Copa del Rey champions. Did he just say that the ACB is the best basketball league in the world? Yes. Yes, I did. Honestly, the NBA might be where you go to find the best players in the world, but it is far from the best league and it is debateable that it even offers the best basketball. I will concede that the first issue is exactly how you define “best”? It’s so inherently subjective that one would have to actually conduct extensive research in order to adequately quantify the standards of the respective leagues. Now, I am someone who does have a tendency to conduct extensive research into things that most people probably wouldn’t prioritise. Then again, most people watch the X-Factor and most people use the expression “lol”, in some cases almost in place of actually laughing, so who really cares about what “most people” think? I will put it to you, dear reader, that the best basketball is that which involves an appropriate amount of team play, a suitably high standard of individual play and an enjoyable fan experience. Given that many of you will have access to Euroleague games online (don’t download illegally, kids), I can leave the first two up to you. However, one can only assess fan experience by actually attending games. In my view, it is here that the NBA really lets itself down. Firstly, what the hell was the lockout all about? A bunch of very rich men arguing with a bunch of very wealthy men (in the words of Chris Rock “Shaq is rich; the white man who signs his cheque is wealthy”) over money. Let us not forget that the minimum NBA salary is $473,604 and the average NBA salary is about $5.15M. The average salary of the average American? $41,673. You could also bring race to the table: after all, the NBA is a predominantly African-American league. The Pew Research Center, on 26 July 2011 (you can look it up if you like), estimated that the median wealth of white households was twenty times as much as that of African-American households. It published figures which suggested that the median net worth of white households was $113,149; that of black households was $5,677. So, it is not unfair to say that the gap between the average African-American and the average African-American NBA player is even greater. We need not think too long and hard about other sports where wages are spiralling out of control – the English Premier League now has players who earn over £200,000 each week – but player salaries is just one part of the problem. Ticket prices are crazy. The SeatGeek website has suggested that the average ticket price for a New York Knicks (who are arguably only even watchable these days because of the now-stuttering breakout season of Jeremy Lin, or perhaps a desire to see Carmelo Anthony) game is $304.69. That means that the average American could afford 136 average-priced Knick tickets each year and nothing else. That’s not even two per home game. Of course, these prices are skewed by the extortionate floor seats. I literally just went onto ticketmaster.com and looked up the most expensive ticket I could find for the Knicks-Trailblazers game. Any idea? $4,114.55. Which means, again, the average American could afford ten of these each year. (TCC tip, if you are going to an NBA game, check out stubhub, where you can often get lower deck seats for about $50. I was once three rows from the front at a New Orleans Hornets game – okay it was only Detroit, but seeing Chris Paul made it worthwhile – in a seat that cost me $60, and that was only because I’d bought two tickets, as the seller would only sell a pair. Sad tales from my life part II coming next week). Or, to return to the figures published by Pew, the most expensive ticket for a single NBA game in New York is $1562.45 less than the median net worth of African-American households. Incredible (and I mean that in the proper sense of the word: we tend to overuse expressions like “incredible” and “awesome” these days. A solar eclipse is awesome, your new ugg boots are not), isn’t it? 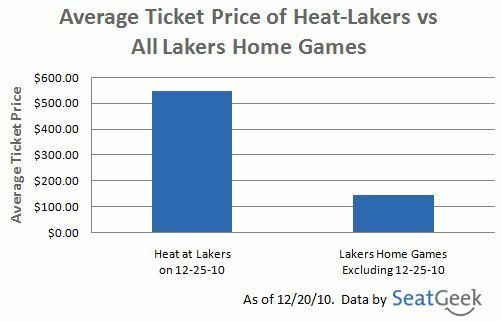 So, it is perhaps fair to say that the NBA has lost sight of what fans can afford. There is more. How long do you think the average NBA game lasts? Most answers (on a google search – by the way, be sure to stop using google if you don’t want to have ALL your searches stored on some weird personal database which will help populate the adverts of every single website accessed from your computer) would suggest that it is roughly two-and-a-half hours. The game itself lasts for 48 minutes. Let’s factor in 15 minutes for half-time, that still leaves roughly an hour-and-a-half of non-game time in which you’re sitting in a seat that has either skinned you for $100, or, if you’ve gone for the upper-deck, $20 but one from which you can barely see the game and find yourself watching the game on the jumbotron, wondering if you wouldn’t have been better in a bar or your hotel room. Each ACB game I have been to lasted about an hour and a half, speedy even by the standards of the games I participated in, both in Ireland and the UK. This is because they don’t muck around with TV timeouts, there aren’t extended “in game entertainment” sequences – and, surely “in game entertainment” should mean the game itself, not people prancing around or humiliating themselves whilst the players stand around either listening to their coaches advice or, more likely, totally ignoring it – and there isn’t a massive imperative to sell you anything and everything. Nice view, but are you watching the game, or the jumbotron? But, aside from those features which involve the giant tv screen that sits over the arena, everything else exists elsewhere, even in many cases at BBL games. One of the things I love the most about the above video is the fact that so many of the fans are just sitting there, utterly bored and those who realize what is going on quickly try to get themselves in on the action, instead of leaving this young Rudolf Nureyev to his masterpiece: “Look at me mum, I’m on the jumbotron”. If you go to an ACB game, particularly if you ever find yourself in the relatively obscure Basque city of Vitoria-Gasteiz, you will find the fans far more involved in the game than the vast majority of NBA games. The fans of the team currently known as Caja Laboral (formerly Tau Ceramica) are absolutely incredible. When I went to my first ACB game, in Barcelona, the fans made an absolute din for the entire game. And that was only against Vive Menorca. Most readers will be aware of the lower-bowl cavern that was the American Airlines Arena in Miami last season as those fans who could afford lower-bowl seats declined to show up to watch the Lebron James-Dwyane Wade show until the second quarter. Then, the same fans would depart well in advance of the end of the game in order to miss the traffic (and, believe me, downtown Miami can be a real bottle-neck immediately after a Heat game). This would never happen in an ACB game. Partially, that’s because games are usually organised at a sensible time (we saw a Barcelona game a few years ago at 4pm on a Saturday: football games tend to be on Sunday evenings), but mainly it’s because the fans actually enjoy being there. One of the main reasons that ACB games are so enjoyable is because they mean more. Eighty-two games in each NBA season (for elite teams, you can add at least ten on top of that) inevitably brings many players to the conclusion that they can “mail in” any particular game, or, in the case of Rasheed Wallace, an entire regular season. The ACB plays 34 regular season games. Teams also tend to only have two American players. An overweight or unmotivated import is a luxury no ACB team (or indeed Superleague team, come to think of it) can afford. It is also interesting to see how the different ACB teams use their imports; in the case of Barcelona, Pete Mickael is only used sporadically throughout games and is very much a role player. CJ Wallace, the former Princeton forward, is basically just a hustle player, rarely recording significant stats. Barca’s third US import is former South Carolina Gamecock (u-huh-huh-huh) and European veteran, Chuck Eidson. Caja Laboral were, in the semifinals of the Copa del Rey, up against Barcelona, having defeated their fellow Basques, Lagun Aro GBC. Barca had enjoyed a comfortable 20 point win against Alicante in the quarterfinals. The game was touch-and-go for the first three quarters, before Barcelona blew their opponents away with an 18-5 run in the fourth to seal the game. Barcelona were led by giant Slovenian Erazem Lorbek, whilst Juan Carlos Navarro (whose brief NBA career was highlighted with 156 made three point shots in a single season) was disappointing with a quiet three points. For Caja Laboral, Mirza Teletovic impressed in a performance that included an incredible posterizing dunk on Barca shot-blocker Fran Vazquez. The real stars of the show, however, were the supporters of the Basque side, who never once stopped singing and dancing, even through to a full hour after the game had finished. I can honestly say that I have never been to a sporting event where the fans were so involved in the game. Next up was Real Madrid against surprise package, Banca Civica from Seville. Madrid had been expecting to face the better-known Malaga side, which features Team GB star centre, Joel Freeland, but they had lost by twelve the previous evening. One of the most intriguing aspects of Real Madrid is that they do tend to rely on their American stars. In recent years, the side has been led by Louis Bullock, a former Michigan Wolverine whose standing as the school’s all-time third top scorer was overturned as part of the scandal over loans from team booster Ed Martin (Chris Webber was also involved), as well as by Irish standout Pat Burke and Jeremiah Massey (who famously was given a Macedonian passport in 2008 despite allegedly never having been in the country prior to this). This season is no different, with a crucial role played on the side by former Utah State shooting guard Jaycee Carroll and Duke standout Kyle Singler. Indeed, we had a rather bizarre moment when the teams were announced and we realised that the rangy red-haired Madrileno was none other than the forward who had been drafted by the Detroit Pistons before deciding to stay in Spain after the NBA lockout ended. In the event, the game was something of a rollercoaster. Madrid took a thirteen point lead in the first quarter, only to have eleven of those points wiped out by a Banca Civica comeback in the second. Madrid again dominated the third, winning by fourteen and even a 24-16 final quarter in favour of the men in pink could not overcome the deficit. The following day, Madrid defeated Barcelona 91-74 to claim their first title since 1993, a period which had seen them defeated at the final stage five times, including two defeats in a row to Barcelona. I thoroughly recommend that all readers make an attempt to see ACB basketball live at some point. You will not regret it.